PocketTouch is the paper-free solution for taking food and drinks orders to the kitchen. Designed specifically for the hospitality and catering industry, this EpoS software for hand-held devices records orders at the touch of a screen and can be extended to facilitate payment at the table. reminding waiting staff to ask if the customer prefers fries/rice/baked potato or how the steak should be done. when items are not on the menu, PocketTouch incorporates the option to add hand-written messages using a touch screen pen or stylus. 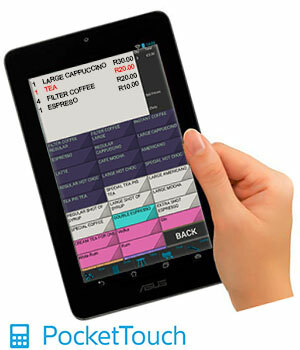 Bills can be printed out via PocketTouch and paid for either at the touch till (TouchPoint) or at the table. TouchPoint is available on both Android 2.2 devices or above and Apple iOS devices. With the influx of low cost Android tablets, PocketTouch was brought to the Android platform affording much more choice to the end user introducing a cost saving.Additionally, PocketTouch is also available for iDevices in the Apple Appstore and can run on iPads, iPods and iPhones of all shapes and sizes. Note: PocketTouch is designed as a companion app to our TouchPoint EPoS system, and may need to be configured by your dealer. We offer 24 hours service to all your clients. Download and install TeamViewer™ for remote support and assistance. © 2019 - Hotsoft - Property Management Software. All rights reserved.